Before coming to Korea, I did my research on the plethora of unique “themed” cafes that are super popular in Korean culture. Out of all of the themed cafes I researched, one of the ones I was looking forward to visiting the most was the dog cafe! 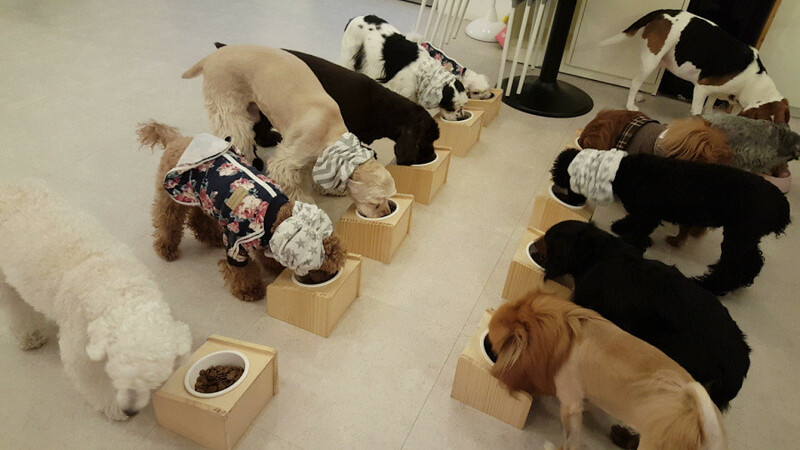 Animal cafes are very popular in Japan and Korea — from cats and dogs to even raccoons and sheep! My friend Stina from Montreal and I decided to visit a dog cafe in Hongdae for the first time. 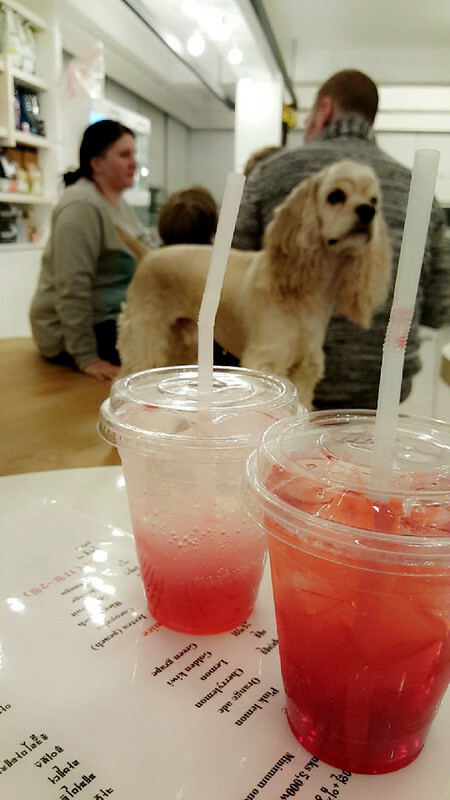 There are several dog cafes all over Seoul, but we decided to go to one she had researched before. I can’t remember the name, but the dogs there were very done up and adorable! Not all dog cafes have the same rules; but most have the same general structure in which we pay an entrance fee or buy a drink from the cafe, or both. For this cafe, we had to pay both. Upon entering the cafe, we were warmly greeted by the owners, instructing us to leave our shoes at the door and put on house slippers. We also put our bags and coats away and sanitized our hands well. In the meantime, the dogs were roaming around freely in the gated but very open cafe space. Since it was close to closing time, all of the dogs were quite sleepy. They were adorably groomed from head to toe and dressed in cute, floral outfits. Stina and I ordered two refreshing iced teas from the menu and played with the dogs while we waited for our drinks. Since it was a “requirement” to enter the cafe and play with the dogs, we didn’t really care about our drinks honestly. But playing with the dogs was quite a challenge… they were nice and friendly, but sleepy and did not come up to us or cuddle like how we thought they would. It must’ve been because it’s been a long day — so here’s tip! If you plan on going to a dog cafe, make sure to go earlier in the day when the dogs are full of energy. Although the dogs were tired and uninterested in Stina and I for the most part, we still got to pet some of them and enjoyed our short time there nonetheless. I don’t have many photos because I was too busy recording them on video instead! We spent an hour there and left right before closing. Since I was not satisfied with my experience, I decided to visit another one the very next day! This time, with a different friend — JD from Singapore. 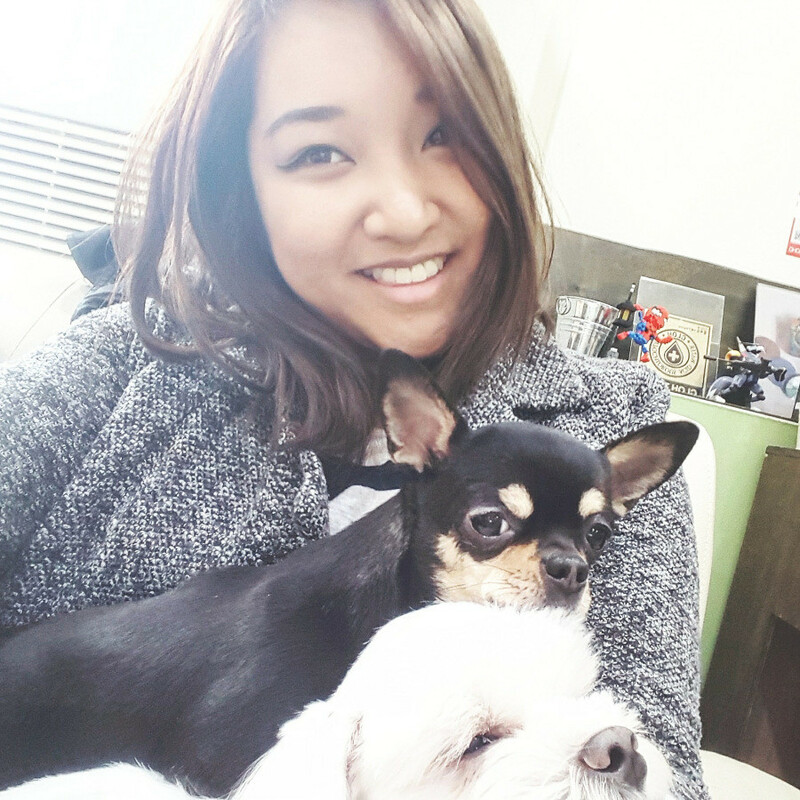 He took me to a different dog cafe, called Sunnyne Puppy Cafe, also located in Hongdae. The atmosphere in this cafe was completely different — once we entered the cafe doors, all of the dogs barked together loudly and rushed over to the gate, causing quite a commotion! It was quite shocking how loud they became. Every time a new customer came in, they would bark just as loud and come rushing to the door. It was so funny to observe! This cafe did not have an entrance fee, we just had to order drinks. What was also completely different from the other dog cafe was that the dogs were super comfortable and friendly with people! I was shocked how they would just come up to us and sit on our laps. At one point, I had not one but two — two dogs cuddling on my lap and did not want to budge for about half an hour! There was a golden retriever who surprised us with his skills — every time a new customer came in, he would retrieve the menu in his mouth and give it to the customer to order. As the customer looked at the menu, he stood quietly and waited for the customer to make a decision. Once the customer checked off their choice, he would retrieve the menu in his mouth again and run off to give it to the bartender. It was so cute and fascinating watching him! There was also a huge dog who acted like the boss of the place, making his rounded every now and then to make sure all of his canine friends were doing okay and that everything was in order. After visiting Sunnyne dog cafe, I realized how important it is to choose the “right” dog cafe for you. Some people may like the other one better if they are not comfortable with dogs and just want to take pictures from a distance. However, if you’re someone like me who wants to get up and personal with the puppies without even trying to get their attention and just sit there as they come up to you — Sunnyne is the place for you! I enjoyed my dog cafe experience much more at Sunnyne. I can’t wait to go back and visit all of the dogs again, since I bonded with them in the hour and a half I was there.